But in fact, the princess role that’s ubiquitous in girls’ toys today was exceedingly rare prior to the 1990s—and the marketing of toys is more gendered now than even 50 years ago, when gender discrimination and sexism were the norm. How did we get this gender dividing toy trend grow indirectly to changes in society? My own theory on the subject is that 50 years ago families had less disposable income to spend on toys. Toys were more gender neutral because they were to be shared amongst siblings. Toys were made of higher quality materials, and they would be passed on to cousins and future generations. Today, toys are made of cheap materials, like plastic, in Chinese factories. They cost less in comparison to salaries, well maybe not all of them. Savvy toy marketing has created desires in children along gender lines. In my research on toy advertisements, I found that even when gendered marketing was most pronounced in the 20th century, roughly half of toys were still being advertised in a gender-neutral manner. This is a stark difference from what we see today, as businesses categorize toys in a way that more narrowly forces kids into boxes. 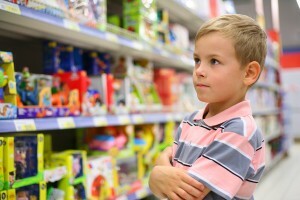 For example, a recent studyby sociologists Carol Auster and Claire Mansbach found that all toys sold on the Disney Store’s website were explicitly categorized as being “for boys” or “for girls”—there was no “for boys and girls” option, even though a handful of toys could be found on both lists. 5o years ago toy advertising did market to specific gender roles targeting homemaking skills in young girls and work force preparation in boys. From baby dolls to erector sets, toys reflected societal norms. Interestingly, this trend declined in the 1970s in response to changes in society. However, gender-coded toy advertisements like these declined markedly in the early 1970s. By then, there were many more women in the labor force and, after the Baby Boom, marriage and fertility rates had dropped. In the wake of those demographic shifts and at the height of feminism’s second-wave, playing upon gender stereotypes to sell toys had become a risky strategy. In the Sears catalog ads from 1975, less than 2 percent of toys were explicitly marketed to either boys or girls. More importantly, there were many ads in the ‘70s that actively challenged gender stereotypes—boys were shown playing with domestic toys and girls were shown building and enacting stereotypically masculine roles such as doctor, carpenter, and scientist. I was a young child in the 70s, and we did have dolls. My sister had an easy-bake oven. We also had toy dogs, horses, sports equipment, games, etc. that were not gender specific. When our boy cousins came over to play, and vice versa, there was always something to play with even though we were of different genders. It doesn’t have to be this way. While gender is what’s traditionally used to sort target markets, the toy industry (which is largely run by men) could categorize its customers in a number of other ways—in terms of age and interest, for example. (This could arguably broaden the consumer base.) However, the reliance on gender categorization comes from the top: I found no evidence that the trends of the past 40 years are the result of consumer demand. That said, the late-20th-century increase in the percentage of Americans who believe in gender differences suggests that the public wasn’t exactly rejecting gendered toys, either. What exactly is wrong with gender specified toys? Nothing per se, unless they pigeon hole children into roles and ideas about who they are or will be. If young girls grow up thinking they need to be rescued by a prince or have an unattainable body, this is harmful. Having access to toys of designed for different genders can mitigate their effect, but not all families are comfortable with boys playing dress up in princess gowns holding baby dolls. What did your children receive as gifts this holiday season? How gender-specific were these gifts?